Baxyl® is a liquid hyaluronan (HA) supplement formulated for human consumption to alleviate joint discomfort. With MHB3® Hyaluronan as its active ingredient, Baxyl is covered by four U.S. Patents and demonstrates proven efficacy and safety with double blind, placebo controlled university studies. 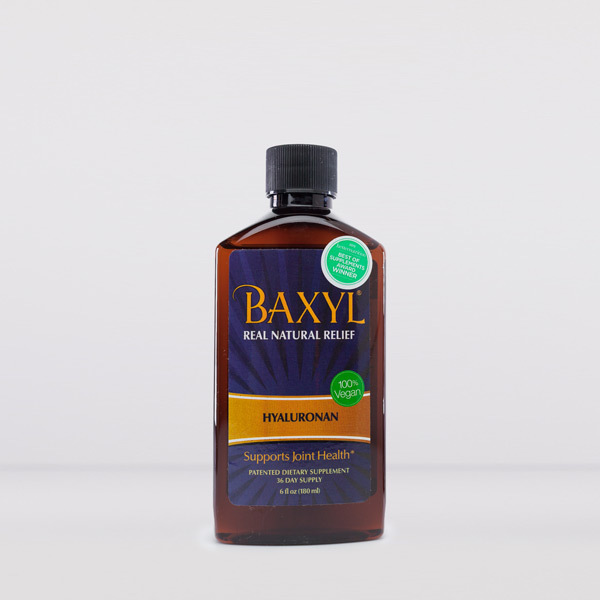 Because Baxyl’s liquid formulation is fully hydrated, it is absorbed quickly and is immediately put to work by the body. Baxyl is vegan, gluten-free, soy-free, yeast-free, corn-free, sugar-free, non-GMO, and has no artificial or natural colors or flavors. Baxyl uses only the finest ingredients from the USA and Europe with full traceability on all ingredients and offers a customer satisfaction guarantee.